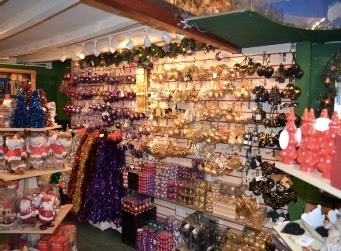 We have an on-site Shop open from the 20th November to 24th December. During that period we are open from 9am-5pm seven days a week. 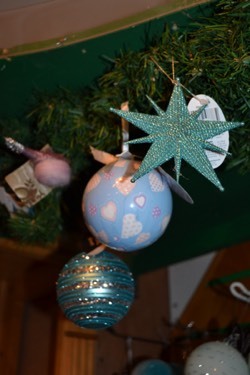 We stock a huge range of Christmas decorations, which evolves each year so you should be able to find what you want; whether it is a traditional, classic bauble or something more modern and in this year's key colour. We love having things that are just a little bit out of the ordinary! Alongside that, we have a great array of lights for both inside and outside use. Once we get into the Christmas period, keep an eye on our Facebook page for a preview of some of the new decorations we are carrying this year, but bear in mind we do sell out of certain lines so don't delay if you see something you like. Our on-site florist makes fresh door wreaths throughout the Christmas period and can always make to order if you have a very specific look you are after. Whilst you are in the shop, don't forget to look up and see our Christmas Railroad delivering its cargo of trees- look closely and you should be able to spot what else our trains are delivering! We believe passionately that cut trees are displayed at their best in stands that hold water and we have a large range available for sale in the shop. We are very happy to trim the base of your tree to fit your stand. We can take payment by either cash or credit card. FANCY A HOT CHOCOLATE AND A MINCE PIE ONCE YOU HAVE CHOSEN YOUR TREE? A relatively new addition to the Farm is our Tea Room that is open each weekend during our Christmas season. The 'Great Little Red Bus Tea Room' is a red double decker bus that has been converted to a cafe, with seating upstairs and a kitchen downstairs. Serving a variety of soup, sandwiches, hot drinks and cakes, the tea room specialises in local sourced produce. It is well worth a visit, so why not plan it into your day when you come to the tree farm?